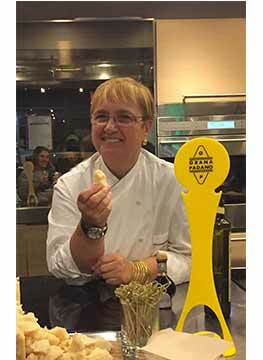 Lidia Bastianich is an Italian chef who moved to the United States at the age of 12. At 24, she opened Buonavia, the first of a long series of restaurants inspired by Italian cooking. In the 80s-90s, she starred in the first interviews and cooking lessons, followed by ‘Lidia’s Italy’, her first cook book, a collection of recipes of the different regions and provinces of Italy. Today, Lidia is one of the best loved faces on American TV, a successful author, owner of 2 wineries in Italy, 6 US restaurants and equity in the Eataly flagship stores in New York, Chicago, Boston etc. A real force of nature! When promoting the products of her home region, Lidia has always paid special attention to Grana Padano.